The dromedary camel, commonly known as the one-humped camel, is one of the species in the genus Camelus , which also contains the Bactrian, two-humped camel. Camels are in the family Camelidae. Dromedaries account for approximately 90% of all the camels in the modern world (Anitei). Camel’s ancestors have developed extensively over time, and the modern camel shares the same ancestors as other modern species, as well. Read on to learn more about the history of the camel’s evolution. Though there are currently no wild camels in North America, the first 36 million years of camelids’ existence was in this area (Irwin 37). Scientists have traced the origins of the modern camel to the Protylopus a genus containing several closely related species, which would have been found about 50 million years ago during the Eocene period in North America, perhaps around the then heavily forested area that is modern day South Dakota (Mukasa-Mugerwa). At the time this camelid was living, the climate was beginning to cool and the tropical forests were starting to recede. Protylopus was a very small animal, about the size of a modern hare. They had no hump as modern camels do, and were no more than two feet tall, about two feet long, and weighed less than 50 pounds. This animal had a simple arrangement of low-crowned teeth along the jaw. The tooth and jaw structure of Protylopus indicates that it’s diet consisted of low-level leafy forest vegetation. The front limbs were shorter than the back limbs, and each limb contained four toes. This early ancestor of camels seemed to have narrow hooves and not broad pads like the modern camel. It is likely that Protylopus had a tendency to stand on their hind legs to feed on vegetation (Irwin, 36-38). During these epochs, approximately 25 to 5 million years ago, camelids began to evolve further. It was at this point that camelids lost the two side toes, bringing them down to the two-toe modern formation. These early camelids also had no humps, similar to Protylopus (Irwin 38). One of the camelids found somewhere between the Oligocene and Miocene epochs was Poebrotherium. The Poebrotherium was larger than the Protylopus, standing about three feet tall and being sized similar to a modern goat. Poebrotherium resembled a modern day llama, with a narrow snout and long neck. Their front teeth were angled forward for the purpose of shearing vegetation. The distinguishing characteristic of camelids that existed at this time, such as Poebrotherium, were the long necks that allowed them to graze off trees and tall plants (Irwin, 39). After Poebrotherium, camelids evolved into several different species, one of which being Procamelus, which lived through the Oligocene to the Miocene epoch from about 20 to 5 million years ago (“Fossilworks”). At this time, the earth was beginning to cool, and dry savannah was being replaced by steppe lands. Because of these environmental changes, camelids during the end of the Miocene era entering into the Pliocene epoch began to grow larger with longer necks. They also began to develop the distinctive tooth and jaw structure of the modern camel, as well as the soft, padded foot. Their teeth became longer and developed higher crowns. At this time, camelids also began to develop a pacing gait known in modern camels. Throughout this period, many camelids appeared that quickly became extinct. Several of such species were Ocydactylus, which was a camelids with a neck as long as a giraffe’s. 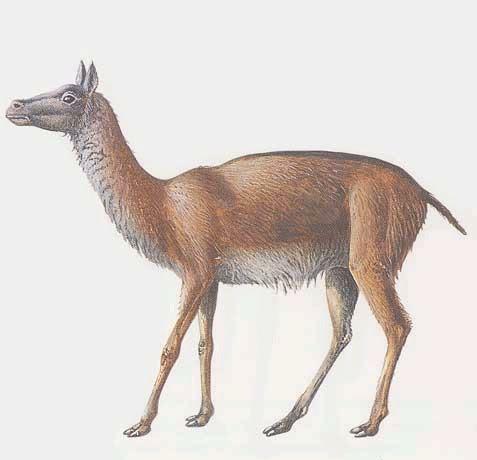 Also existing for short periods of time were Stenomylus, a very small camelids, similar to a gazelle, and Alticamelus which was about nineteen feet tall, and was likely the earliest of the giant camelids (Irwin 39-41). During the Pliocene epoch around 2.5 million years ago, North and South America came together creating a land bridge that gave my species the opportunity to migrate. Many camelids migrated south, becoming the early ancestors of the modern domesticated llama and alpaca (Mukasa-Mugerwa). Other camelids entered into a journey across the Bering Straits to travel into Asia, and these camelids were destined to one day evolve into the modern Bactrian and dromedary camels. Scientists believe that the first camels to enter Asia through this route were Bactrians, with one-humped dromedaries evolving later from this species (Irwin 42-43). A fossil recently discovered on Ellesmere Island in the Arctic region of Canada may explain the evolutionary process from the early Poebrotherium to the modern camel. The fossil indicates that there was a creature that was closely related to Paracamelus that lived around 5 million years ago during the middle of the Pliocene epoch, a time at which it is believed early camelids were migrating out of North America into Asia. The fossil seems to indicate that this camelid was about twice the size of a modern dromedary camel, and it’s location and time period may explain some of the adaptations found in modern camels. Dr. Natalia Rybczynski, a paleontologist with the Canadian Museum of Nature, has speculated that some of these adaptations including “their wide flat feet, large eyes, and humps for fat” (Warr), may have developed given the animal’s need to survive in an arctic climate. These recent findings shed light on the evolution of the Procamelus into the modern Camelus. It is generally believed that the modern one-humped dromedary evolved from the two-humped bactrian species (Camelus bactrianus), which likely developed the way it did as a result of the arctic climate, with its thick coat that can withstand temperature of -20 degrees Fahrenheit and that falls away when temperatures reach 100 degrees Fahrenheit. Around 2 million years ago, the bactrian, looking very similar to the modern bactrain, standing about 7 feet tall and weighing an average of 1,800 pounds, had evolved from the Procamelus or perhaps the Paracamelus camelids that had traveled across the Bering Strait into the arctic regions of Asia (“National Geographic” ). At the time that the Bactrian camel entered Asia, their migration across the continent was great and varied. Some migrated as far as southern Russia, with others, such as Titanotylopus and Giganotylopus, being found in southern Ukraine about 5 million years ago. These would have been some of the camelids that were extremely large in size, likely developed to acclimate to the cold climate, as mentioned above. As mentioned earlier, scientists believe the modern dromedary evolved from the Bactrian. Some of the evidence for this theory includes that the modern dromedary camels foetus, during prenatal development, have two humps, and also a vestigial hind hump in adult dromedaries. Given this evidence, it has been speculated that modern dromedaries evolved in the hotter, drier climates in western Asia (Mukasa-Mugerwa). Given this evolutionary evidence, it is likely that the ancestors of the modern dromedary camel traveled to the Middle Eastern and North African region. The wild dromedary would eventually become extinct in the Middle East, and only the domesticated dromedaries would survive (Irwin 41-43). During a period about 10,000 to 12,000 years ago in which most megafuna was wiped out in North America, the original camelid, Prolypotus, became extinct. However, evolution had already taken it’s course, and it is estimated that between around 3000 and 1000 BC the camel began to enter domestication (Cockrill 21). It was by this time that the camel’s fate as the thankless perpetrator of human civilization had already been sealed. I intended to post you the tiny remark so as to say thank you over again with the amazing opinions you’ve contributed on this site. It’s certainly particularly open-handed with people like you to make unreservedly all a number of people could have offered for sale as an ebook to help make some dough for themselves, principally given that you might well have done it in case you considered necessary. The guidelines as well worked as the fantastic way to understand that most people have the same interest like my personal own to know the truth very much more in terms of this matter. I believe there are thousands of more pleasant occasions in the future for individuals that browse through your site. Just re-reading ‘Centennial’ by James Michener. I first read it least 40 years ago before the internet was ever thought of!! Your article is fascinating and shows he really did do his homework. Thank you. Very well written. I thought the article was very comprehensive and easily understood. It is excellent to have a full understanding! Who is this by I would like to use this article for an evolution project on camels and I need a person I could put the author buy, someone I can contact.